Bombardier Aerospace (French: Bombardier Aéronautique) is a division of Bombardier Inc. It is headquartered in Dorval, Quebec, Canada. See also: History of Bombardier Inc.
After acquiring Canadair in 1986 and restoring it to profitability, in 1989 Bombardier acquired the near-bankrupt Short Brothers aircraft manufacturing company in Belfast, Northern Ireland. 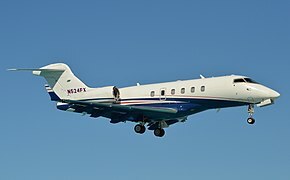 This was followed in 1990 by the acquisition of the bankrupt American company Learjet, a manufacturer of business jets headquartered in Wichita, Kansas; and finally the money-losing Boeing subsidiary, de Havilland Aircraft of Canada based in Toronto, Ontario in 1992. The aerospace company now accounts for over half of Bombardier Inc.'s revenue. In 2015 and 2016, the most popular aircraft included its Dash 8 Series 400, CRJ100/200/440, and CRJ700/900/1000 lines of regional airliners although the company was devoting most of its Research and Development budget to the newer CSeries. It also manufactured the Bombardier 415 amphibious water-bomber (in Dorval and North Bay), and the Global Express and the Challenger lines of business jets. The CSeries, which Bombardier offers in several size versions, is competing with the Airbus A318 and Airbus A319; the Boeing 737 Next Generation 737-600 and 737-700 models; and the Embraer 195. Bombardier claims the CSeries would burn 20% less fuel per trip than these competitors, which would make it still about 8% more fuel efficient than the Boeing 737 MAX, which was introduced in 2017. The launch customer for the CSeries, Lufthansa, signed a letter of intent for up to 60 aircraft and 30 options in 2008. The manufacturing complex in Montreal was redeveloped by Ghafari Associates to incorporate lean manufacturing of its CSeries aircraft. In January 2012, the company began manufacturing simple structures such as flight controls for the CRJ series from a transitional facility near Casablanca, Morocco, its first facility in Africa. On 30 September 2013 it broke ground on its permanent facility, due to open late 2014. In October, a joint development deal between Bombardier Aerospace and a government-led South Korean consortium was revealed, to develop a 90-seater turboprop regional airliner, targeting a 2019 launch date. The consortium would include Korea Aerospace Industries and Korean Air Lines. In November 2012, the company signed the largest deal in its history, with Swiss business jet operator VistaJet, to deliver 56 Global series jets for a total value of $3.1 billion. The deal included an option for Bombardier to manufacture and sell an additional 86 Global jets, which would value the entire transaction at $7.3 billion. 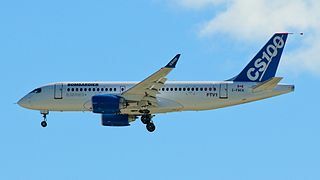 In April 2013, Canada's Porter Airlines placed a conditional order for 12 CSeries aircraft, with options for another 18. However, this was conditional on the Billy Bishop Toronto City Airport (on an island just off downtown Toronto) allowing jets to use the facilities and on a 550-metre extension of a runway. Studies underway included an environmental assessment, master planning exercise and preliminary runway design. In 2015, the Government of Canada announced that it would not approve a change to allow jets at the airport and the proposal was shelved. In January 2014, Bombardier Inc. cut 1,700 employees from Bombardier Aerospace to save costs due to a 19 percent drop in orders in 2013. In July the same year, Bombardier reorganized its corporate structure in response to its underperformance. President Guy Hachey retired and Bombardier Aerospace was split into three divisions: business aircraft; commercial aircraft and aerostructures; and engineering services. As part of the corporate overhaul, 1,800 jobs were cut. In its 2014-year end statement, Bombardier Aerospace reported that it had reduced the number of employees by 3,700 over the year; delivered 290 aircraft and had orders for 282 more; and also claimed "strong long-term potential". On 29 October 2015 Bombardier announced a US$4.9-billion third-quarter loss and took a $3.2 billion writedown on the CS series in the third quarter. 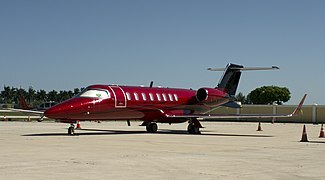 Bombardier also said it would cancel its Learjet 85 program, taking another US$1.2-billion writedown and cancelling the 64 outstanding orders. Particularly because of the CSeries, the company's debt had reached approximately $9 Billion. Bombardier shares fell 17.4 per cent on that day, perhaps because the CSeries had not recorded a single firm order since September 2014. As of 21 December 2015, the company had only 243 firm orders for the CSeries, but a US$2.5 billion cash infusion – $1 billion from the provincial government plus a $1.5 billion investment from the Caisse de dépôts et placements du Québec – was keeping the parent company adequately funded and optimistic. At that time, the federal government had not yet made a decision as to whether a grant would be provided but Prime Minister Justin Trudeau told the media on 11 December that he was well aware of the importance of the aerospace sector to the country's economy. On 17 February 2016, Bombardier announced its 2015 profits were $138 million before taking a $5.4 billion write-down. That same week, the company also announced it would cut 7,000 jobs. After a very long and expensive development process, costing US$5.4 billion to date, and including a US$3.2 billion writeoff, the small (110–125 seat) CS100 version of the CSeries received initial type certification from Transport Canada on 18 December 2015. At the time, the company had only 243 firm orders and letters of intent and commitment for another 360, with the most recent in September 2014. Most of these were for the CS300 model. The first CS100 was expected to be flying by mid-2016 in Lufthansa colours. "Certification is a great thing, but 2016 is going to be critical for orders," analyst Chris Murray, a Managing Director with Alta Corp, told Bloomberg Business. Fred Cromer, president of Bombardier's commercial aircraft unit hinted during a press conference on 21 December 2015 that price cuts – or other incentives – may be offered during negotiations in order to jump start sales (list price for the CS100 was US$71.8 million and for the CS300 US$82 million). In addition to attractive prices, customers "are going to want support, they are going to want spares, they are going to want training," he explained. While Cromer would not offer specifics, his comments about the possibility of an "aggressive deal" were widely published worldwide and were likely to plant the seed about discounting in the minds of potential purchasers. In an attempt to boost its profit margin, Bombardier Aerospace announced on 12 January 2016 that it would cancel deals with its third party sales agent (Tag Aeronautics). The company also said it would cancel 24 firm and 30 optional orders for its aircraft, hoping to resell these later, without paying a sales agency fee. Marketing of the CSeries was adversely affected by production delays and stiff competition in early 2016. On 20 January, United Continental Holdings Inc. announced that it had ordered 40 Boeing 737-700s instead. Air Canada announced it would purchase up to 75 CS300s, a larger variant of the CSeries, on 17 February 2016. Prior to this announcement, there had been no orders for CSeries aircraft since 2014. The C-series program was expected to have positive cash flow after approximately 200 aircraft are delivered. David Tyerman, an analyst with Canaccord Genuity, commented the difficulty in winning orders illustrates market difficulties faced by Bombardier and questions how profitable the next C Series order they win will be for them. According to Bjorn Fehrm of the aviation consulting firm Leeham Company, the first 15 CSeries aircraft produced in 2016 each cost Bombardier $60 million to make, but will sell for only $30 million. Bombardier had been in negotiation with Delta Air Lines and the latter finally placed an order in April 2016 for 75 of the CS100 series models with an option for 50 additional aircraft. At full list price, the deal would total US$5.6 billion but some sources were convinced that Delta had received a significant discount. Air Canada also firmed up its tentative order for CSeries jets in late June 2016. The company ordered 45 of the CS300s with an option for another 30. Statements by the two companies indicated that the firm sale would be worth $3.8 billion, and the option would increase that to $6.3 billion if it were exercised. (However, these figures are based on the full list price of the aircraft.) Deliveries would not start until late 2019. In the meantime, negotiations were continuing with the Federal government for a subsidy of $1 billion. The next day, Bombardier delivered the first CSeries aircraft to Swiss International Air Lines which was the first to start flying them. On 24 March 2011, Shanghai-based Commercial Aircraft Corporation of China (Comac) and Bombardier Inc. signed a framework agreement for a long-term strategic cooperation on commercial aircraft. The intention was to break the near-duopoly of Airbus and Boeing. Aircraft covered by the programme included the Bombardier CRJ-series, CSeries and Q-series; and the Comac ARJ21 and Comac C919. On 16 October 2017, Bombardier Aerospace and Airbus announced a partnership on the CSeries program and in July 2018 Airbus acquired a 50.01% majority stake, Bombardier keeping 31% and Investissement Québec 19%, to expand in an estimated market of more than 6,000 new 100-150 seat aircraft over 20 years. As a result of this arrangement the CSeries is now marketed by Airbus as the Airbus A220. Access to Airbus's supply chain expertise is intended to save production costs while the headquarters and primary assembly line remain in Québec, while U.S. customers will benefit from a second assembly line at the existing Airbus Mobile factory in Alabama. Airbus did not pay for its share in the program, nor did it assume any debt. Airbus insists that the company has no plan to buy out Bombardier's stake in the C-series program and Bombardier would remain a strategic partner after 2025, however clauses allow it to buy out Quebec's share in 2023 and Bombardier's 7 years after the deal closes, though it also stipulates production is required to remain in Quebec until at least 2041. Bombardier CEO Alain Bellemare said the partnership would significantly accelerate sales. "It brings certainty to the future of the program so it increases the level of confidence that the aircraft is there to stay. Combining the CSeries with Airbus's global scale ... will take the CSeries program to new heights". On 8 November 2018, Viking Air parent Longview Aviation Capital Corp. acquired the Dash 8 program and the de Havilland brand from Bombardier, in a deal that should close by the second half of 2019. Viking had already acquired the discontinued de Havilland Canada aircraft model type certificates in 2006. By November 2018 the sales of the higher-performance Q400 were slower than the cheaper ATR Aircraft. Bombardier announced the sale was for $300 million and expects $250 million net. The sale will result in $250 million annual savings. Bombardier also sold its business jet training program to CAE Inc. for $645 million and announced 5,000 job cuts over 18 months within 70,000 employees worldwide: 500 within 6,500 in Ontario, 2,500 in Quebec and 2,000 outside Canada. Bombardier is keeping its options open with regard to its loss-making CRJ line, as it shifts its focus from commercial to business aircraft. Bombardier should increase business jet shipments from 135 in 2018 to 150-155 in 2019. Bombardier plans revenues of $16.5 billion in 2018, rising to over $20 billion in 2020 with a free cash flow of $0.75-1 billion, mostly due to the large Global 7500. Business Aircraft revenues should increase from $5 billion for 2018 to $6.25 billion in 2019 and $8.5 billion in 2020 with 180 deliveries, including aftermarket within the 4,700-aircraft fleet doubling from the 28% captured in 2015. Aerostructures & Engineering Services should grow from $2 billion in 2018 to $2.25 billion in 2020. Airliner revenues should shrink from $1.7 billion to $1.4 billion in 2019, halving losses to $125 million, with deliveries flat at 35 CRJs and Q400s, and should be profitable with CRJs only in 2020. Brazil and Canada engaged in an international, adjudicated trade dispute over government subsidies to domestic aircraft manufacturers in the late 1990s and early 2000s. The World Trade Organization decided that Brazil ran an illegal subsidy program, Proex, benefiting Brazilian manufacturer Embraer from at least 1999–2000; and that Canada illegally subsidized its indigenous regional airliner industry. In late September 2017, the World Trade Organization announced that it would consider Brazil's complaint filed in February, including allegations that the Canadian government unfairly subsidized the CSeries. Embraer claimed that the subsidies are an "unsustainable practice that distorts the entire global market, harming competitors at the expense of Canadian taxpayers." On 29 October 2015, the Quebec government announced that it would invest US$1 billion (roughly CAD $1.3 billion) to save the struggling CSeries and protect jobs  in what some called a "risky gambit". That would give the province a 49.5% interest in the limited partnership that will control the assets, liabilities and obligations of the CSeries program. Media reports initially suggested that Bombardier had also asked Ottawa for a repayable loan of $350 million  but it became clear that the province expected the federal government match its $1 billion loan in return for a near 50 percent stake in the CSeries jets project. There would be "unbelievable pressure" on this government to help the company, Ian Lee, an economics professor at Carleton University's Sprott School of Business, predicted. Aid was definitely essential, because the project has saddled Bombardier with debt, forcing it into a struggle to raise cash in order to keep it afloat. Both the provincial and federal contributions would be in the form of a repayable loan but it is questionable whether they would ever be repaid according to independent economist Mark Milke. In fact, Milke also referred to the bailout loans as "corporate welfare" in The Globe and Mail of 4 November 2015. A few days after his swearing-in, on 10 November 2015, Prime Minister Justin Trudeau told the Canadian Labour Congress that Bombardier Inc. must make a "strong business case" for federal aid. Trudeau agreed that the company exemplified important high value manufacturing "... an extremely important part of Canada for years to come. Aerospace is a great example of that, as is the auto sector and others"  but made it clear that the government's decision would be based on the best interest of Canadians, not on "emotion, politics or symbols". Finally, in April 2016, the federal government offered an aid package to the company but as of 15 April, had not divulged the amount or conditions it imposed. On that date, some media reported that Bombardier had rejected the offer but an unnamed source advised Reuters that in fact, negotiations were still underway. On 14 April 2016, Bombardier shares were at a six month high based on rumors that Delta had ordered CSeries jets. On 28 April the order for 75 aircraft, with an option for 50 more at a later date, was confirmed by Delta. However, George Ferguson, senior airlines and aerospace analyst at Bloomberg Intelligence, told the Toronto Star that his calculations indicated that "Bombardier sold the CSeries for $4 million on average per plane less than what it costs to make". The company continued to request a $1 billion aid package from the federal government. In mid May, news reports indicated that the federal government had offered a $1 billion aid package (in addition to the $1 billion subsidy offered by the Government of Quebec) but with a condition: that the company eliminate the dual-class share structure which enables the Bombardier and Beaudoin families to control Bombardier in spite of only a minority ownership. According to Bloomberg, the talks were at a "standstill" on 13 May because of this condition. The federal plan also recommended that the company issue new shares to gain $1 billion in additional funding. Negotiations between the Trudeau government and Bombardier were still underway on 8 July 2016 with some wondering whether giving a billion dollars to a company that had lost $6.5 billion in two years would be a logical investment. Nonetheless, the Toronto Star predicted that the government would proceed with the bailout because bankruptcy for the company would lead to the loss of some 70,000 jobs and the loss of significant Canadian exports, which had totaled $34.2 billion in the previous five years. In May 2016 Federal Finance Minister Bill Morneau said the aerospace sector is "critically important" to Canada. In February 2017, the federal government agreed to provide Bombardier with $372.5 million in interest-free repayable loans, to be issued in instalments over the following four years. Most of that amount was intended to aid the production of the Global 7000 business aircraft; one third was intended for the CSeries. Bombardier Aerospace has manufacturing, engineering and services facilities in 27 countries. The production facilities are located in Canada, the United States, the United Kingdom (Northern Ireland), Mexico and Morocco. On May 3, 2018, Bombardier announced the sale of its Toronto Downsview facility where it manufactures the Global business jet family and the Q400 regional turboprops for $635 million, leased back for three to five years to maintain Q400 production, while a 38 acres (15 ha) site is leased at Toronto Pearson International Airport to open a final assembly plant for the Global business jets. Montreal Trudeau International Airport – Headquarters. Challenger 300, 605 and 850 final assembly and flight test. Global family interior completion. Montréal Mirabel International Airport – CRJ700/CRJ900/CRJ1000 and A220 family final assembly and flight test. Saint-Laurent, Quebec – Product Development Centre. Cockpit and aft fuselage manufacturing facility. Downsview Airport – Bombardier Dash 8 final assembly and flight test. Querétaro – Aircraft component manufacturing facility for Learjet 85, Challenger 605, CRJ700/CRJ900/CRJ1000 NextGen, Q400 NextGen and Global 6000/7000. Casablanca – Flight controls for CRJ series aircraft. Belfast, Northern Ireland – Aircraft fuselage, engine nacelle, wing manufacturing and assembly facility. Wichita, Kansas – Learjet family final assembly and flight test. North Bay Airport – Bombardier CL-415 was the final assembly and flight test until production ended in 2015. After a lull in 2002, the plant was restarted by contractor Vortex Aerospace Services in 2005. While production has ended, Vortex continues to provide training for CL 415 at the facility. Viking Air – Canadian manufacturer that purchased the type certificates from Bombardier for all discontinued de Havilland Canada designs. ^ "Aerospace Directory." Bombardier Inc. Retrieved on December 4, 2010. "400 Côte-Vertu Road West Dorval, Québec Canada H4S 1Y9." Address in French: "400, chemin de la Côte-Vertu Ouest Dorval (Québec)." ^ "Inc. – Bombardier – Home". Bombardier. 2011-02-25. Retrieved 2011-03-02. ^ Maynard, Micheline (14 July 2008). "A New Bombardier Jet Draws Only Tepid Demand". Retrieved 12 February 2018 – via NYTimes.com. ^ Farnborough, U.K. Aerospace (2008-07-13). "Bombardier Press Release, July 13, 2008". Bombardier.com. Retrieved 2011-03-02. ^ "Bombardier awards contract to Ghafari to redevelop CSeries Aircraft Manufacturing Complex". ATW Online. 2010-08-16. Retrieved 2010-08-16. ^ Choi Kyong-Ae (8 October 2012). "South Korea Consortium in Talks With Bombardier About Developing Passenger Plane -Source". Wall Street Journal. Retrieved 10 October 2012. ^ "Porter Airlines Signs Purchase Agreement for up to 30 Bombardier CS100 Aircraft; Becomes CSeries Aircraft's Canadian Launch Customer" (Press release). Bombardier Aerospce. 10 April 2013. Retrieved 5 November 2015. ^ Lu, Vanessa (3 November 2015). "Porter wants airport studies completed, despite Liberal win". Retrieved 12 February 2018 – via Toronto Star. ^ Susan Taylor (January 21, 2014). "Bombardier cuts 1,700 jobs to save cash after jet delays". ^ Kristine Owram (26 July 2014). "Bombardier's aerospace restructuring takes a page from train division". Retrieved 22 August 2014. ^ a b c d Owram, Kristine (28 October 2015). "Bombardier Inc to get US$1 billion from Quebec government to rescue troubled CSeries". ^ a b Perreaux, Les; Chase, Steven; Van Praet, Nicolas (29 October 2015). "Quebec makes high-risk bet with $1-billion Bombardier investment". The Globe and Mail. Retrieved 31 October 2015. ^ Editorial, Reuters. "Bombardier sees new Global business jets in service by 2018". Retrieved 12 February 2018. ^ Lu, Vanessa (24 November 2015). "We're being selective, Bombardier says of CSeries customers". Toronto Star. Toronto, Ontario, Canada. Retrieved 25 November 2015. ^ Ljunggren, David (11 December 2015). "Canada PM: still studying possible federal aid to Bombardier". Reuters. Thomson Reuters. Retrieved 22 December 2015. ^ a b c d e "Plane truths". The Economist. ISSN 0013-0613. Retrieved 19 February 2016. ^ Lu, Vanessa (18 December 2015). "Bombardier's CSeries jet certified for commercial service". Toronto Star. Toronto, Ontario. Retrieved 19 December 2015. ^ a b c Tomesco, Frederic (21 December 2015). "Bombardier Sees `Aggressive' C Series Pricing Amid Drought". BloombergBusiness. Bloomberg LP. Retrieved 22 December 2015. ^ "Bombardier receives CSeries certification from Transport Canada". CBC News. CBC/Radio Canada. 18 December 2015. Retrieved 19 December 2015. ^ Van Praet, Nicolas (13 January 2016). "Bombardier Ending Sales Contract with Tag Aeronautics". Globe and Mail. Toronto, Ontario. Archived from the original on 31 January 2016. Retrieved 21 January 2016. ^ Van Praet, Nicolas (21 January 2016). "Bombardier snubbed as United to buy 40 Boeing jets". Globe and Mail. Toronto, Ontario. Archived from the original on 31 January 2016. Retrieved 21 January 2016. ^ Bloomberg (21 January 2016). "Boeing beats Bombardier to United airliner sale". Toronto Star. Toronto, Ontario. Retrieved 21 January 2016. ^ "Here's the Bombardier jet at the heart of a simmering trade war between the US and Canada". Retrieved 12 February 2018. ^ "Delta buying 75 Bombardier CSeries jets, with options for 50 more". Retrieved 12 February 2018. ^ "Canada's Boeing challenger just made a blockbuster deal with Delta". Retrieved 12 February 2018. ^ The Canadian Press (28 June 2016). "Air Canada finalizes $3.8B order for 45 Bombardier CSeries jets". Toronto Star. Toronto, Ontario. Retrieved 29 June 2016. ^ "COMAC and Bombardier Sign Strategic Agreement on Commercial Aircraft" (Press release). Bombardier. 24 March 2011. Retrieved 25 June 2011. ^ Ostrower, Jon (1 April 2011). "Many questions surround Bombardier/Comac partnership". Flight Global. Retrieved 25 June 2011. ^ Rapoport, Geoff (17 October 2017). "Airbus To Revive C-Series". AVweb. Retrieved 18 October 2017. ^ "Airbus CEO expects to sell 'thousands' of C Series aircraft (20 Oct 2017)". CBC.ca. CBC. Retrieved 2 November 2017. ^ Marowits, Ross (16 October 2017). "European giant Airbus to buy majority stake in Bombardier's CSeries program". Retrieved 12 February 2018 – via Toronto Star. ^ Viking Air Limited (February 23, 2006). "Viking Acquires Type Certificates for de Havilland Canada Heritage Aircraft from Bombardier" (Press release). ^ Bogaisky, Jeremy (8 November 2018). "Bombardier Sells Aging Q400 Turboprop Line, Cutting 5,000 Jobs As It Sharpens Focus On Business Jets". Forbes. ^ "Bombardier to sell Q400 programme". Flightglobal. 8 November 2018. ^ "Bombardier cutting 5,000 jobs, selling Q Series aircraft". CBC News. 8 November 2018. ^ "Bombardier shifts focus away from commercial aircraft". Flightglobal.com. 8 November 2018. Retrieved 9 November 2018. ^ Kerry Lynch (December 7, 2018). "Bombardier Preps For 7500 Delivery 'In Coming Days'". AIN online. ^ Graham Warwick (Dec 11, 2018). "Bombardier To Focus On High-End Business Jets And Aerostructures". Aviation Week & Space Technology. ^ "Bombardier's bad week continues with WTO set to investigate Brazil's complaint over subsidies". 29 September 2017. Retrieved 12 February 2018. ^ "WTO to also probe alleged Bombardier subsidies into CSeries jets". Retrieved 12 February 2018. ^ "UPDATE 6-Bombardier gets Quebec investment but weak results hurt share". 29 October 2015. Retrieved 12 February 2018 – via Reuters. ^ "Bombardier bailout: Quebec invests $1 billion in C Series aircraft program". www.intelligent-aerospace.com. Retrieved 12 February 2018. ^ a b "404". BNN. Retrieved 12 February 2018. ^ Blatchford, Andy (3 November 2015). "Bombardier's CSeries jam a dramatic early test for Trudeau". Retrieved 12 February 2018 – via Toronto Star. ^ "Trudeau: Bombardier must make a business case if it wants aid - Macleans.ca". 10 November 2015. Retrieved 12 February 2018. ^ Goar, Carol (4 November 2015). "Bombardier exemplifies the pitfalls of corporate welfare: Goar". Retrieved 12 February 2018 – via Toronto Star. ^ "Quebec's Bombardier bailout is not an investment; it's corporate welfare". Retrieved 12 February 2018 – via The Globe and Mail. ^ "Bombardier decision not based on 'emotion or politics or symbols,' Trudeau says". Retrieved 12 February 2018. ^ "Bombardier must justify help: Trudeau". 11 November 2015. Retrieved 12 February 2018. ^ Lampert, Allison; Ljunggren, David (15 April 2015). "Canada gov't in 'constructive' talks on Bombardier aid: minister". Reuters Canada. Thomson Reuters. Retrieved 15 April 2016. Federal government officials have said they do not want to imitate the structure of a separate 2015 deal the province of Quebec struck to support the CSeries, which some felt did not impose enough conditions on the company. ^ a b Lu, Vanessa (28 April 2016). "Despite Delta's order, Bombardier wants Ottawa's help". The Star. Toronto, Ontario, Canada. Retrieved 29 April 2016. ^ Wingrove, Josh (13 May 2016). "Bombardier Aid Talks Stall on Trudeau's $3 Billion Pitch". Bloomberg News. Retrieved 14 May 2016. "It's not our intention to change anything in this regard," Bombardier Executive Chairman Pierre Beaudoin said on 29 April, referring to the dual-class share structure. ^ Olive, David (9 July 2016). "Why Ottawa will spend $1B to prop up Bombardier: Olive". Toronto Star. Toronto, Ontario, Canada. Retrieved 9 July 2016. ^ Wingrove, Josh (20 May 2016). "Bombardier, Aerospace Hit Canada's 'Bulls-Eye', Morneau Says". Bloomberg. Bloomberg LP. Retrieved 9 July 2016. It's a highly innovative Canadian sector. It's got the potential to be a growing and important part of our economy. We're looking at how we can enhance Canada's capability to be innovative — and focusing on a place where you've already got world-leading companies and world-leading technologies makes absolute sense. ^ "Federal government to give $372.5M in loans to Bombardier". The Canadian Press. CBC News. 7 February 2017. Retrieved 28 July 2017. ^ "Transport Canada registers first Global 7000". Flight Global. 5 September 2016. ^ "Bombardier inks $1.7 bn deal with SpiceJet for 50 jets". 29 September 2017. Retrieved 12 February 2018 – via The Economic Times. ^ a b Chad Trautvetter (May 3, 2018). "Bombardier To Move Global Family Production to Pearson". AIN online. ^ "Bombardier Inaugurates Learjet 85 Aircraft Component Manufacturing Facility in Queretaro, Mexico". Reuters (Press release). Bombardier. 21 October 2010. Archived from the original on 27 November 2010. Retrieved 14 May 2012. ^ Rouaud, Pierre-Olivier (8 February 2013). "Bombardier Aéronautique Maroc : Démarrage de la production à Casablanca dans une usine proviso ire" [Bombardier Aerospace Morocco: Production Begins in Casablanca in temporary factory]. usinenouvelle.com (in French). Infopro Digital. Retrieved 28 February 2014. ^ "Presence in the United Kingdom: Manufacturing". Bombardier. Retrieved 2 August 2016. ^ "Bombardier Posts Record 370 Aircraft Deliveries. - Free Online Library". www.thefreelibrary.com. Retrieved 12 February 2018. ^ "Bombardier Announces That Bombardier Aerospace is On Target With 370 Aircraft Deliveries. - Free Online Library". www.thefreelibrary.com. Retrieved 12 February 2018. ^ "Bombardier Delivers 329 Aircraft for Fiscal Year 2004/05: Second Consecutive Year of Increased Deliveries. - Free Online Library". www.thefreelibrary.com. Retrieved 12 February 2018. ^ "Bombardier Aerospace". www2.bombardier.com. Retrieved 12 February 2018. ^ "Boston Finance". Boston.com. Retrieved 12 February 2018. ^ "News - Media Centre - Bombardier". www.bombardier.com. Retrieved 12 February 2018. ^ "Bombardier - China". cn.bombardier.com. Archived from the original on 2013-05-15. Retrieved 12 February 2018. ^ "Bombardier Aerospace Orders/Deliveries from 2016 annual report" (PDF). Archived from the original (PDF) on 17 February 2017. Retrieved 12 February 2018. ^ Bombardier remains upbeat despite slide in business jet output. ^ Commercial Aircraft Status Reports. Wikimedia Commons has media related to Bombardier Aerospace. Gregory Polek (June 26, 2018). "Bombardier Sees Return to Prominence for its Regional Lineup". AIN online. Jon Hemmerdinger (27 June 2018). "ANALYSIS: Bombardier returns to regional aircraft roots". Flightglobal.